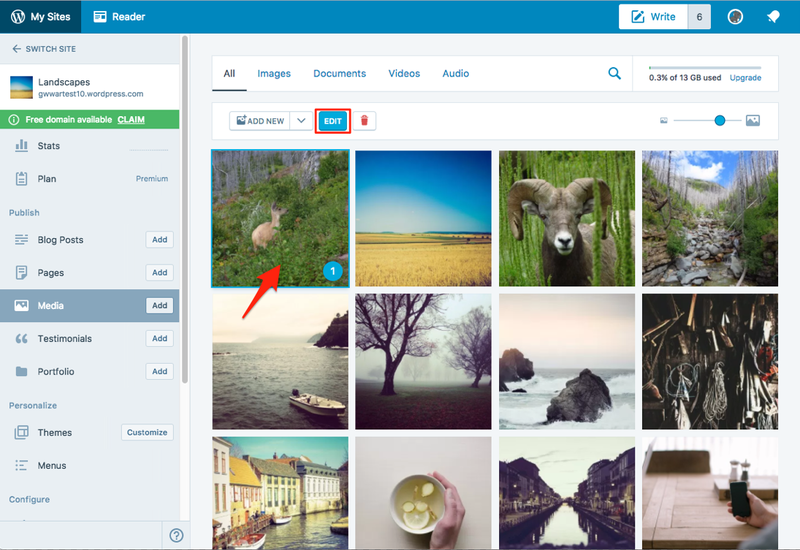 Now you can access your Media Library and upload images even when you’re not writing a post. If you’re happy with the changes you’ve made, select Done. Finding a previously uploaded media item is easier, too. 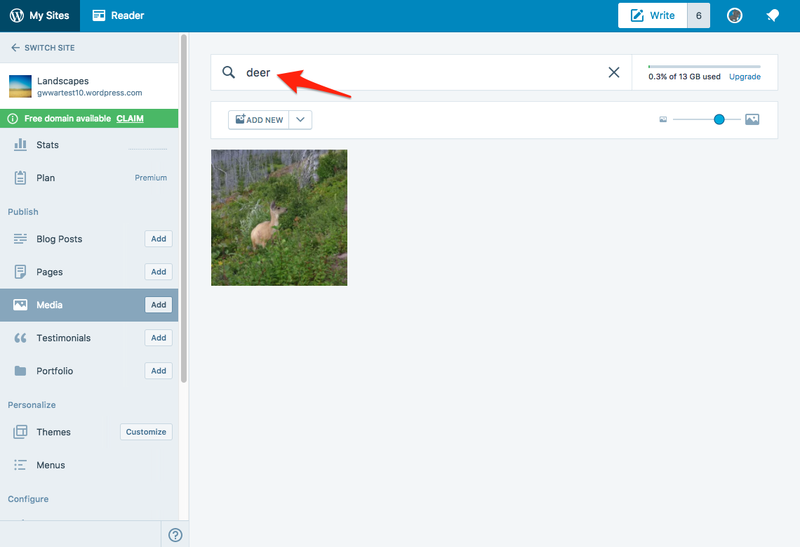 Go to the filter tabs to sort media by file type, or select the magnifying glass to open the search field and search for images by title. In the details view, you can copy the URL link for use in a new post or page. We hope you enjoy these updates to your Media Library! cool. how about adding a media button the the app interface. that would be helpful. We’re currently working on improving the media experience in the mobile apps and the desktop app. Reblogged this on Chris Lauzon's Blog. A resize (scale up with an additional layer) option would have been a complete solution. I do a lot of image resizing (using Google Drawing) before upload. This is mostly due to the fact that Featured Image does not scale them properly for slider view. Nice one. I’ll go try it. I formerly used a plugin to do this on my self-hosted WP site. For instance, I used media tags like “branding” and “category” for images I used over and over. It made blogging life much smoother. There is no MEDIA icon/section on the left hand side of my blog page??? Hello Erik, the media section is on the left hand side of the WordPress.com dashboard. You should see it if you go to https://wordpress.com/media/. Thank you for the feedback, we agree and you will get that feature very shortly! In fact you can test this and other early features on our public test environment. You can read more about it here https://horizonfeedback.wordpress.com/2017/03/03/call-for-testing-calypso-html-toolbar/. I guess “In the details view, you can copy the URL link for use in a new post or page.” is a nice feature. But sometimes is not the first pic the one to be published. And so you have to wait … and media view starts again showing the newest upload. And so I start scrolling again. Should I copy the media content to Google, it will be found very quick. PIC- search in WP is not the greatest job to do. Thanks for the feedback. No hard dates, but we plan on being able to filter media by post in the future. Many thanks. I’m a newbie to WordPress but love the ease of setting up my blog. This will be a great bonus. Hi, why cant i see the updated Media button on my dashboard? Is it only for paid themes or pls correct me if I am wrong??! We’re currently working on improving the media experience in the mobile apps and the desktop app. If you’re on using WordPress.com on a browser you can find this by first clicking on “My Sites”, then “Media” in the sidebar. Or by visiting https://wordpress.com/media/ directly. Looks interesting and useful. 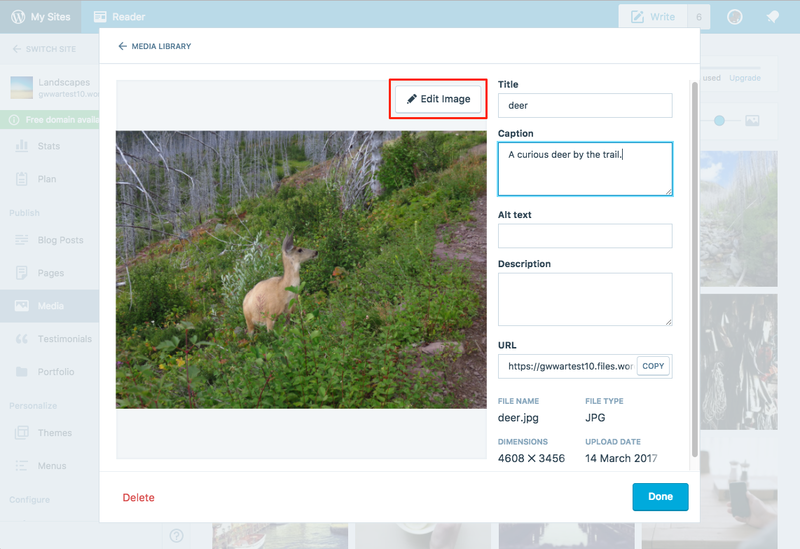 In addition to the earlier suggestion about tags for photos, having the ability to create folders into which the media files could be placed would be helpful as well. Bob, thank you for your reply. I looked up your link, the date for feedbacks has passed, but it seems that you have answered all my problems. including alignment in HTML. I did not think changing manually would work! It does not work for image size. I am not sure what Horizon is so could not test but look forward to the new changes which can solve a lot of problems. Thanks again. Hi, when I use the WordPress.com app on my mac I don’t get the media section but when using a normal web browser I get it. Can you please add it to the app as well. Are there any plans to add this feature to the mobile app? I can rotate images?!?!? Oh glorious day! Thanks WordPress! Using WordPress is becoming more pleasant and better. Nice improvement. Still, however, would like to see the ability to put media into user-created folders for organizing. 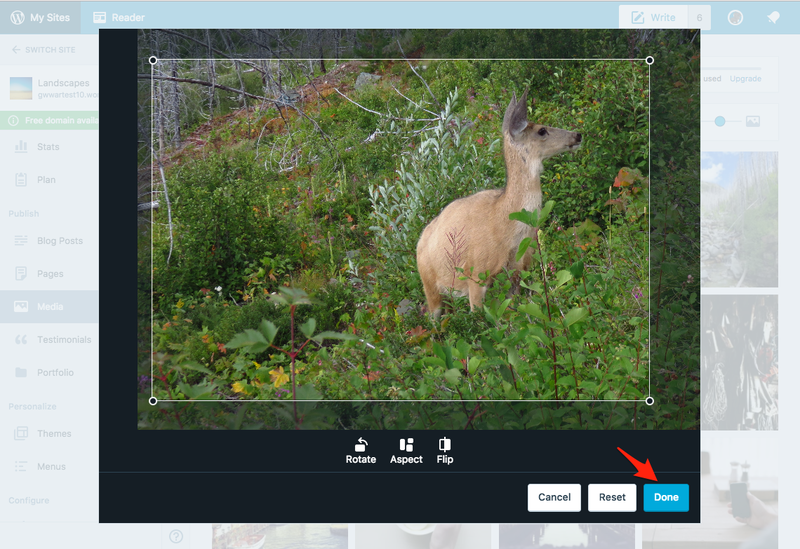 That, or to echo an earlier comment, have the ability to tag photos and search on tags. Is there a way to resize a photo (already stored in the media gallery) from square to rectangular without losing any of its elements? How? Thank you. In the older version, I could type a customized URL to link the photo to its source to credit the photographer. Why was that feature removed in the newer version? That’s one reason I keep reverting back to WP Admin. Thanks for the feedback! Quick credit linking sounds like a useful feature. We currently don’t have any plans for this, but I made a note of your request. 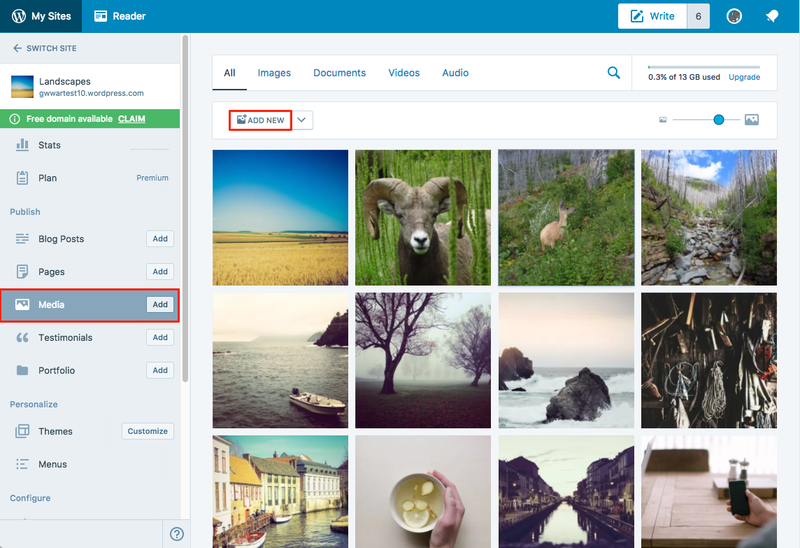 Nice features and useful for all bloggers.